Are you guys excited for the fall🍁🍁🍁!?! I can't wait for colder weather ❄❄, sweaters, hot chocolate , pumpkin flavored everything 🎃🎃🎃, and the upcoming holidays!!! However, since it's almost fall, that means school (college) starts back for me, so this will be my last post for a while. 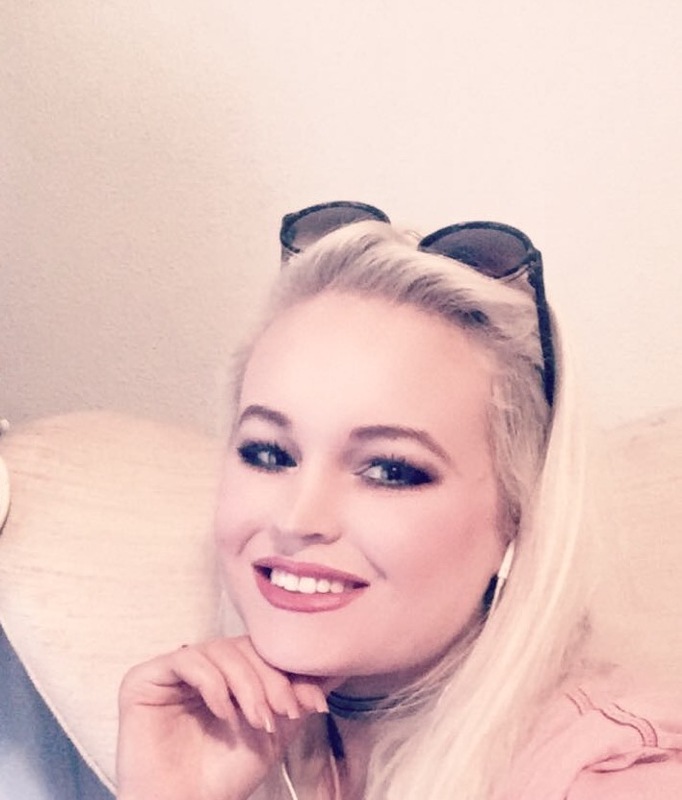 I will probably be back around Thanksgiving🍗 or Christmas though🎄🎅, so I won't be completely away for the rest of the year! I wanted to end this on a skincare related note lol, so when I got the chance to try out these new skincare products, I knew I had to share them with you! I have seen E.L.F. 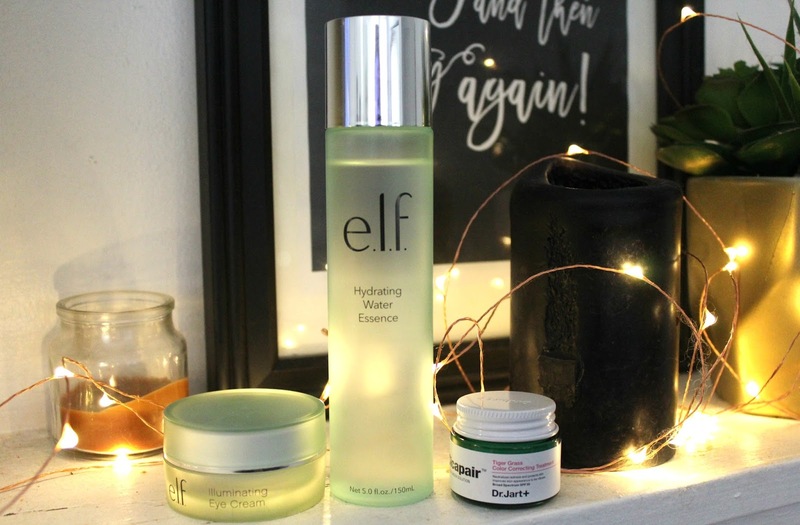 skincare products all over their social media, so I was very intrigued by this separate line of products from their makeup. If you love skincare like I do, then great skincare is essential to make your makeup look flawless on the skin. 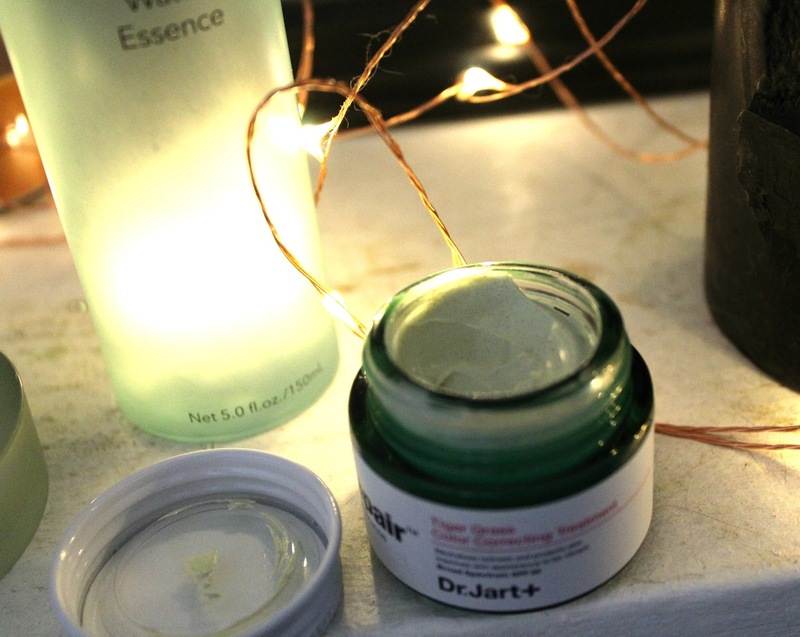 The other product I tried out was a product by Dr. Jart which is on the pricey side, but I promise I have a good reason for including it! The first product from E.L.F. 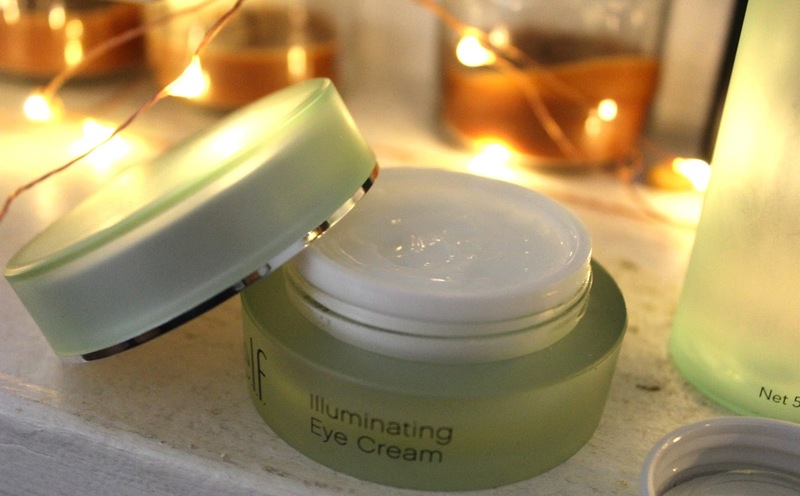 is this Illuminating Eye Cream. This is my first time trying out an eye cream because I just never put much emphasis on taking care of my eyes, but since I'm turning 29 next month, I think it's probably time I should. At first glance, I love the packaging for their skincare products, it's very sleek and elegant looking. The outside of the jar seems like it holds a lot of product. Upon opening, I noticed there wasn't as much product as I was guessing. The product says that it contains purified water, cucumber and green tea. I can attest that you can smell the cucumber once you open the jar. One of the main things I noticed about these E.L.F. products is that they contain NO PARABENS, NO SULFATES, and NO PHTHALATES!!! And the good thing is that they really don't because I checked the ingredients list to make sure. This is a HUGE DEAL if your really into products that are good for you!!! As I was trying this product, I noticed how strange the texture was.....it says it's a cream but I swear it feels as if it has this jelly-like consistency. A little bit goes a long way with this product which really makes up for the lack of amount of product in the jar. Tbh, I didn't really notice a difference until AFTER I stopped using this. Once I stopped using it, my under eyes looked really dark and sunken in, which I hadn't noticed before but I'm really glad this product helped me figure that out! I would really recommend trying this product if you have dark or sunken in under eyes! 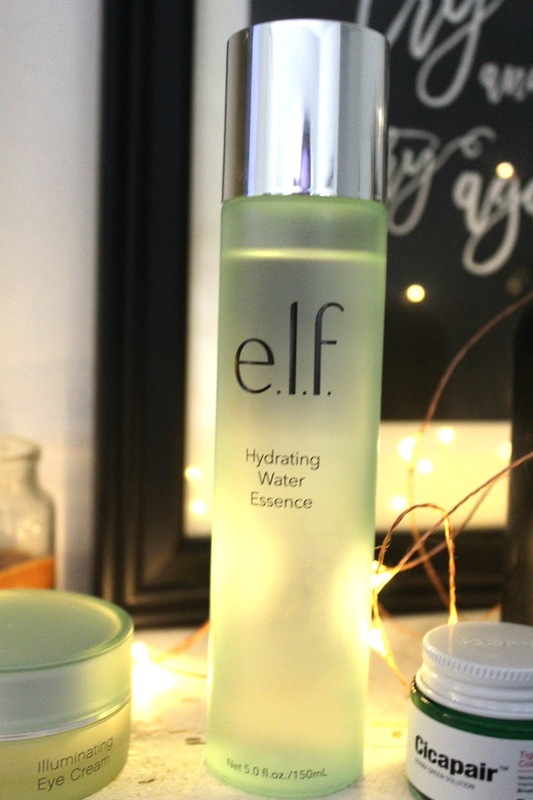 Again, another product from E.L.F..........I seriously think their skincare line is so underrated! This is E.L.F. 's Hydrating Water Essence. The thing that I really love about this product is the amount that you get in the bottle! It is such a good value for the money. It also has a nice fresh smell and contains no parabens, no sulfates, and no phthalates. The bottle says that it's "a lightweight, water-based lotion that hydrates for healthy, glow looking skin. This light, watery formula glides onto skin to hydrate, leaving skin feeling refreshed and smooth. Infused with Purified water, Coconut water, and Algae." I can attest that it does smell slightly of coconut and the texture is really watery. Since the bottle suggests that you use it after cleansing and pressed it into the skin with your fingertips, I did this and immediately felt how cooling and refreshing it felt on my skin. After a couple of hours, it had disappeared into my skin and my skin felt really hydrated. The only downside to this product though is that it broke me out in a few spots. It's important to note though that I have very temperamental skin so it doesn't take much to cause a breakout. If you have skin like mine, I would stay away from this particular one, but if not, then you will love it because it's very hydrating!! This last one is the priciest one of all of them, but I had to include it because it is SO WORTH the money!! This cream by Dr. Jart is great for redness, which I have tons of. I first heard about it through a buzzed article and I knew it sounded like the answer to my red skin prayers, so when I was in Sephora the other day, I stopped by the mini section at checkout to get the miniature version of this because I didn't want to buy the full version until I tried it out first. WOW!!! Am I so glad that I did try this because it has been one of the first things in a long time to get rid of my redness!!! It doesn't really have a scent and it comes in this green color, but once you spread it across your face, it turns a beige color and then your redness is completely gone! It is seriously like MAGIC!!! Like......is that you Harry Potter?!?! I know I sound dramatic but it's only because it really is that good! It's worth the investment in my opinion, especially since many other products claim to get rid of redness but kind of don't. What skincare products have you tried that wowed you? ?